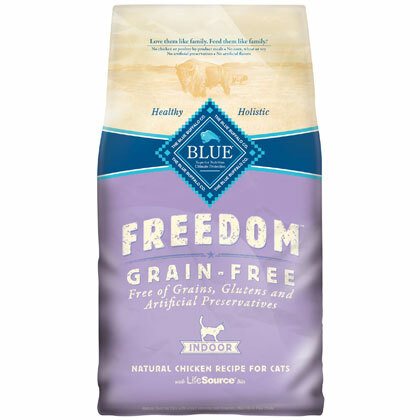 What is Blue Buffalo Freedom Indoor Cat Dry Food? Blue Buffalo Freedom Indoor Cat Dry Food is a high protein food that will provide your indoor cat with a higher concentration of the meat that all cats love. Deboned chicken as its first ingredient, along with chicken meal and turkey meal, provides the essential proteins. Plus, this cat food is formulated specifically to help meet the important needs of indoor cats, by supplying carefully balanced calories from proteins and fat to help maintain an ideal, healthy body weight. Other benefits of this Indoor Recipe include: hairball and odor control, immune system health, healthy heart and eyes, and skin and coat, and urinary tract health. Some cats may be reluctant to try a new diet. In this case, gradually mix in the new food with your pet's current brand until you have transitioned completely to Blue Buffalo Freedom Indoor Cat Dry Food. Nutrition Statement:BLUE Freedom Indoor Chicken Recipe for Adult Cats is formulated to meet the nutritional levels established by the AAFCO Cat Food Nutrient Profiles for maintenance.